Above is the drawing I entered for the SWLA Open exhibition. 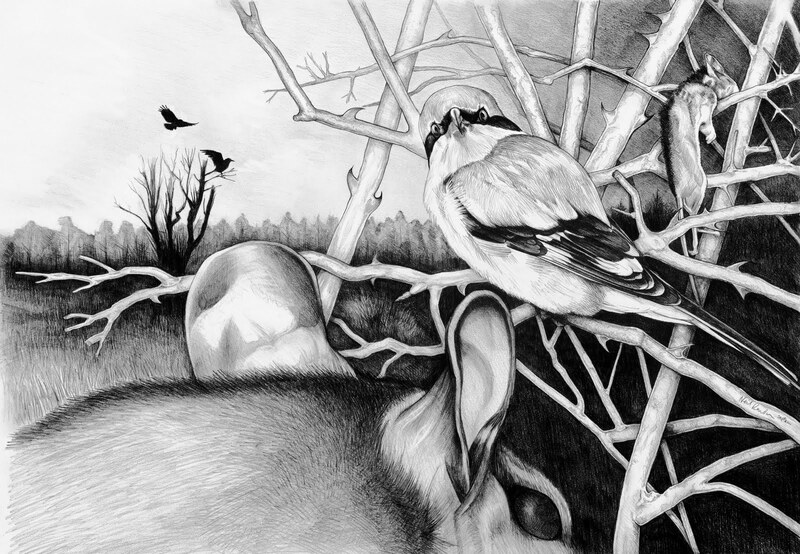 It depicts a Great Grey Shrike sizing up its prey, having already stored a mouse for future sustenance. It's an image of impending doom, but I thought the element of drama might catch the eye. Sadly, it didn't make it passed the final selection process, but no matter. I'll perhaps enter something less graphic for next year, but in the meantime I'm going full steam ahead to produce plenty of illustrations and paintings for the future. I've a number of ideas I want to get down on paper - most will be in pen and ink but some will be in acrylic. Whatever the medium they will take plenty of hours to produce. As soon as they are ready I will unveil them on the blog. I am interested to read honest views on this particular drawing, just to gauge what people think of it. A great drawing Neil, but maybe a bit sinister for the judges. Superbly drawn Neil, but I can see what Ian means, there is an air of menace about it. Maybe it looks as though the mouse in the foreground is sizing up the shrike, instead of the other way round. Point taken on both counts. I wanted it to be sinister though. I should have made the mouse look a more cute than it does here. Also the perspective is a bit off. It's has definitely got the old creative juices going again - the next two or three pieces of work will be better than this first effort. Hi Neil, I like my illustrations to have a graphic element and a feeling of drama or wonder and this ticks both boxes. If you want objective criticism then I feel that the animal in the foreground takes up to much space and isn't necessarily identifiable. Bloody good effort. Yep, agree with that Steve. Thanks for the comments, guys. The next one, in pen and ink, will probably be based on the Frenches Road Waxwings seen earlier this year.